American violinist Soovin Kim is an exciting young player who has built on the early successes of his prize-winning years to emerge as a mature artist ("a superlative soloist" -Miami Herald), equally gifted in concerto, recital, and chamber music repertoire. Mr.Kim's 2008-2009 season begins with performances of Prokofiev with an all-star collection of chamber musicians and soloists under the direction of Leon Botstein at this year's prestigious Bard Festival, appearances at the Marlboro Festival, and appearances in concert programs combining new music with standard repertoire at chamber music festivals in Bridgehampton and Charlottesville. The season includes three tours: one with the legendary Guarneri Quartet, as part of their last season before the public, one with Musicians from Marlboro, and one in Europe with fellow winners of the Borletti-Buitoni Trust Award. Sprinkled throughout the year are numerous recital appearances and collaborations with such partners as Mitsuko Uchida, Ignat Solzhenitsyn, Colin Carr, the Johannes Quartet, William Purvis, Gilbert Kalish, Martin Fröst, the Chiara Quartet, David Soyer, and Jeremy Denk. The season is marked at the beginning by the release of Mr.Kim's new recording on Azica Records (ACD 71243: music of Fauré and Chausson), and in subsequent months by concerto appearances, chamber music, and recital performances in some of the world's most prominent venues - the Concertgebouw, Queen Elizabeth Hall, Royce Hall, Herbst Theatre, Lincoln Center, and Strathmore Hall among them. Soovin Kim's fifth recording has been released by Azica Records (ACD 71243) - a collaboration with pianist Jeremy Denk and the Jupiter String Quartet. About Mr.Kim's concerts with Mr.Denk, the Philadelphia Inquirer has remarked "their joint appearances [are] not to be missed". The new recording features Kim and Denk in the Fauré A Major Sonata, Op.13; they are also joined on the disk by the Jupiter String Quartet in the rarely performed Chausson Concerto in D for Violin, Piano, and String Quartet, Op.21. His first solo CD (Azica Records ACD 71235), Niccolò Paganini's demanding 24 Caprices for solo violin, was released in February 2006, zoomed to Billboard's Classical Chart, and was named Classic FM magazine's Instrumental Disc of the Month ("he emerges thrillingly triumphant...a thrilling debut disc."). In concert programs throughout each season, Mr.Kim makes sure to maintain a balance of new music with core repertoire. 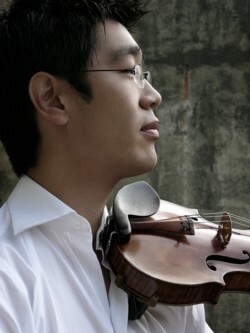 In 2008-2009, in addition to his performances in Korea with his quartet M.I.K., which performs and records a great deal of new music, Mr.Kim will tour compositions commissioned by his American ensemble, the Johannes Quartet, in a program with the Guarneri Quartet featuring the music of Derek Bermel, Esa-Pekka Salonen, and William Bolcom. 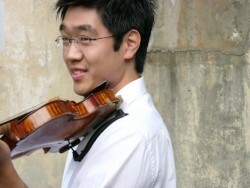 Mr.Kim's 2007-2008 season featured performances of the Brahms Violin Concerto, Op.77 with the Annapolis Symphony Orchestra under the direction of Jose-Luis Novo; playing the world premiere of a new work by R. Murray Schafer at the Leo Rich Theater in Tucson; appearances at Ravinia, the Freer Gallery, the Metropolitan Museum of Art and the Isabella Stewart Gardner Museum as part of a Musicians from Marlboro tour; and an evening of Brahms sonatas in Beacon, NY with Jeremy Denk. Recent concerto appearances include performances of the Mendelssohn concerto with both the Cincinnati Chamber Orchestra and the National Philharmonic, the Mozart Concerto in A, K.219 with the Nashville Symphony, and Vivaldi's Four Seasons with the Chamber Orchestra of Philadelphia under the direction of Ignat Solzhenitsyn. Mr.Kim enjoys teaching and has held posts at Yale and, currently, at the State University of New York at Stony Brook, to which he commits a considerable amount of time each year.